When the artistic mind is unburdened by law or general practicality, creativity can run free. 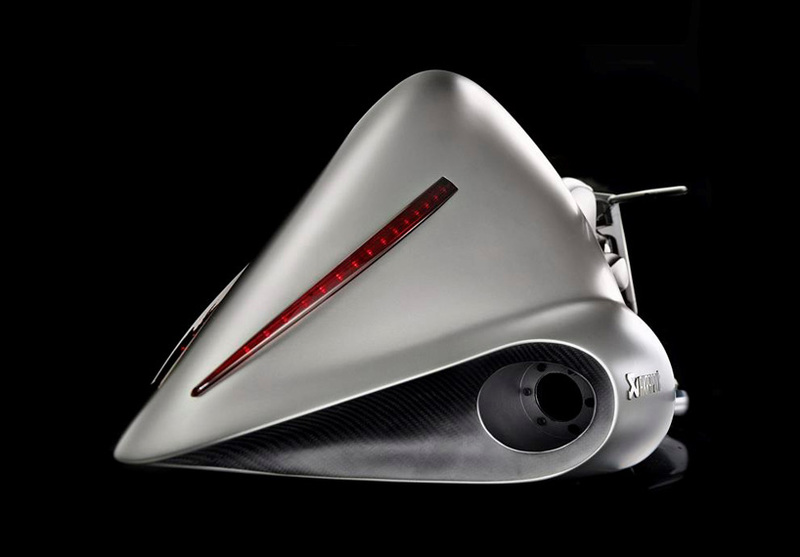 Pushing the boundaries of motorcycle design is the latest from Slovenian automotive company Akrapovic, which is set to debut its latest concept at the Bad Salzuflen Custombike Show in Germany this month. The Full Moon, which ostensibly borrows its streamlined design from flamboyant Art Deco motifs, is essentially an exercise in opulence. To properly express its 1,524 cc engine, the bike sports two custom exhaust pipes at the back unit, which also houses a standing suspension that fixes the bike upright when stationary. The framework and body are both composed of an enduring aluminum and carbon composite material. Sadly to say, neither you nor I will probably ever own one of these. Akrapovic plans to tour this custom chopper to all of its upcoming autoshow appearances without the slightest hint of a production run. But you never know, perhaps maybe once in a blue moon.